I posted a picture on Instagram a while back of me decorating this cake and I dubbed it the “Ultimate Man Cake” in jest. 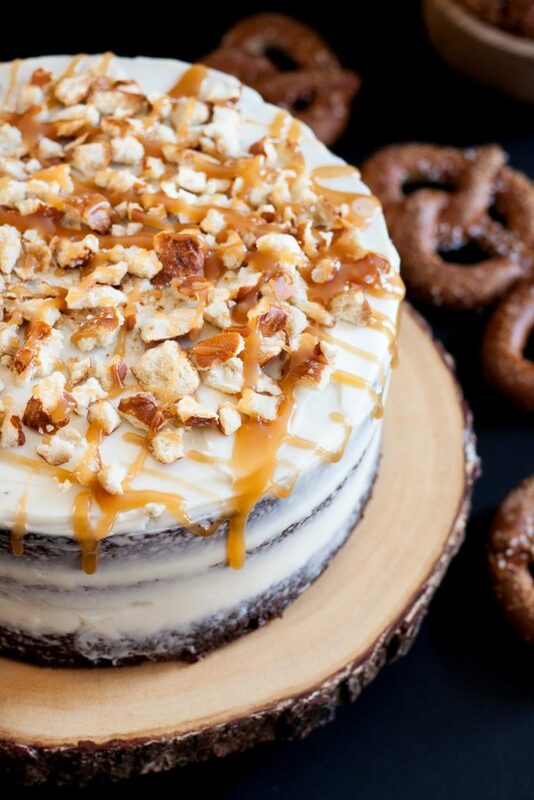 I mean, it has beer and pretzels, chocolate and caramel, cream cheese frosting… who wouldn’t love this cake? It’s like “bar” bar meets dessert bar. But it really is pretty fancy in terms of beer cake, and I love how the sweet and salty play together to make a really incredible flavor profile. I’ve been making Guinness cupcakes for a long time – I started when we were first married as something fun to take to the office on Saint Patrick’s Day, and found out my reputation for this yearly tradition preceded me to California and the Godfather’s next office. I just never put the recipe on the blog because there are already about a thousand Guinness cupcake recipes out there. Buuuuuutttttt, when I was poking around Hillary’s website, I came across these mini cakes and the second I saw the pretzels, I saw It. 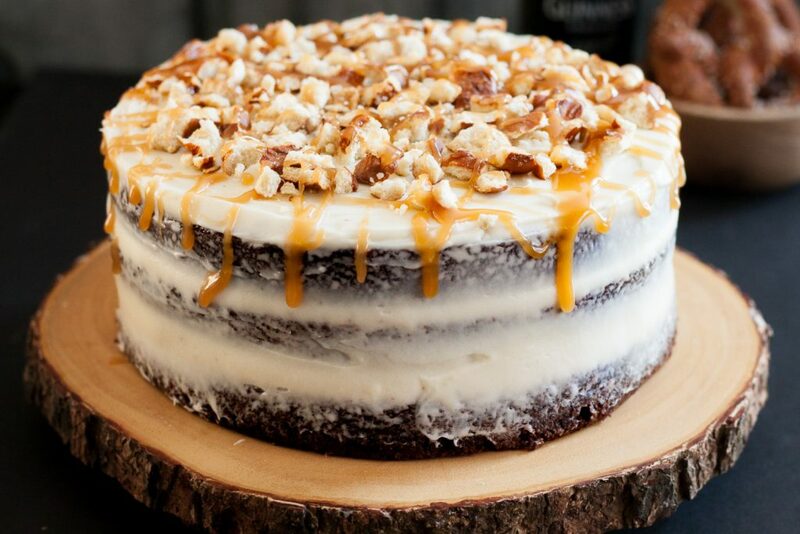 I saw this cake, and caramel, and layers, and SALT! 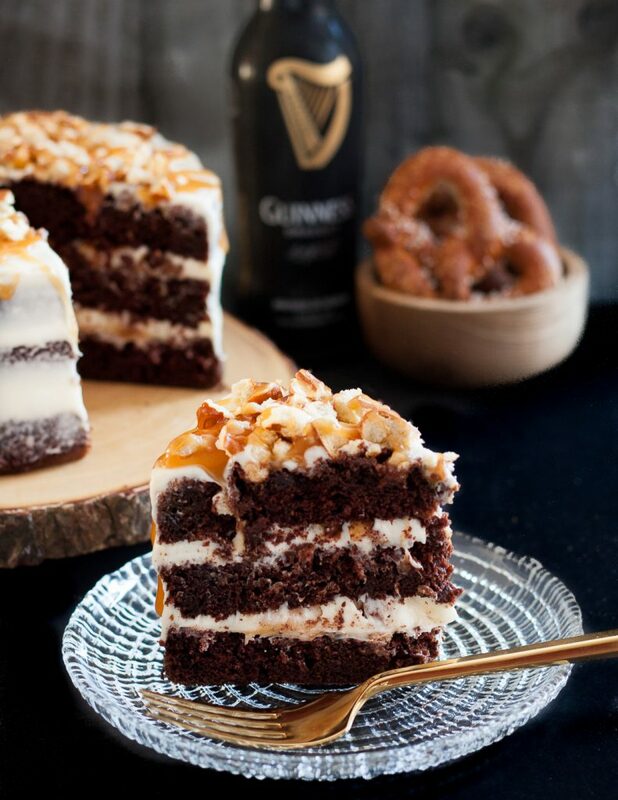 Sweet and salty Guinness chocolate cake I can get behind posting. So much so that I think it’s appropriate to share before the annual influx of beer recipes since you should probably make this for a football party dessert or something. It’s worth breaking out the forks – disposable if you have a crowd over, of course. I hope you enjoy this cake as much as we did! It might just need to make a re-appearance around Saint Patrick’s Day, but you’ll want to practice now. 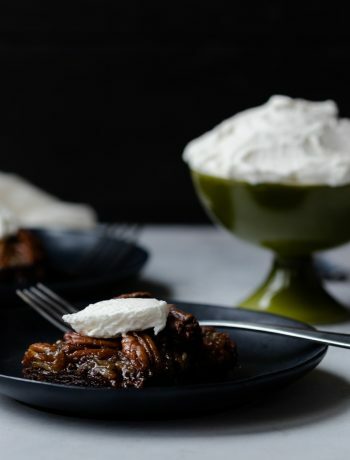 Also, if you’re looking for a unique assortment of recipes ranging from Korean to twists on classic comfort food, stop by Hillary’s website and check it out! Pour the bottle of beer into a small saucepan and bring just to a simmer over medium heat. Allow to cook 3-4 minutes and then remove from the heat and bring to room temperature. To help speed up the process, you can drop the butter into the warm beer to melt it. If you end up with large pieces of unmelted butter, remove and melt separately in the microwave. 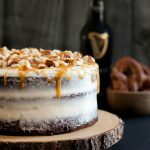 Place the room temperature beer and melted butter in the bowl of a stand mixer (or a large mixing bowl, this is an easy cake to mix by hand too), and add the sugar, sour cream and vanilla extract. Stir in the eggs one at a time. If your cake is 3 layers, bake the layers fro 20-24 minutes. If you are making a 2 layer cake, bake for 27-33 minutes. The center of the cake will spring back lightly when touched, and a tester will come out clean. Allow the cakes to set in the pan 10 minutes before carefully turning out to a cooling rack to cool completely. You may also wrap the cakes in plastic wrap while still slightly warm and refrigerate to chill and make decorating easier. 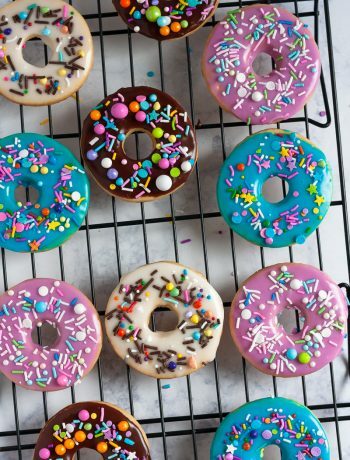 This also helps if you plan to bake one day and decorate the next. Make the frosting by creaming together the butter and cream cheese. Add the powdered sugar 1 cup (120 g) at a time, scraping the sides of the bowl after each addition. Once the desired consistency is reached, add the vanilla extract. Depending on the number of layers in your cake and how you choose to decorate, you may have a little extra. Level your cake layers. Place the first layer on your platter or a cake board, add a layer of frosting, sprinkle on a sparse layer of chopped pretzels, top with caramel, add the next layer of cake. Repeat for a 3 layer cake. Frost the outside of the cake as desired - I opted for a thin layer and the minimalist look. Top with caramel, pretzels, and a sprinkling of sea salt. - I made this cake 3 layers by baking to in an 8"x3" deep pan and the third in my 8"x2" deep pan because I like tall cakes. You can absolutely make this as a 2 layer cake with two 8"x2" pans, or you may bake two layers first and then bake the third. It's not ideal, but it works. Do what makes you happy. Does the pretzel go super soggy inside? How far in advance would you make this? That depends on the pretzel. I used a really hard sourdough and it was fine for 2-3 days. I probably wouldn’t make this more than a day or day and a half in advance for the best texture. This recipe was fantastic! Just made it for a dinner get together with friends. 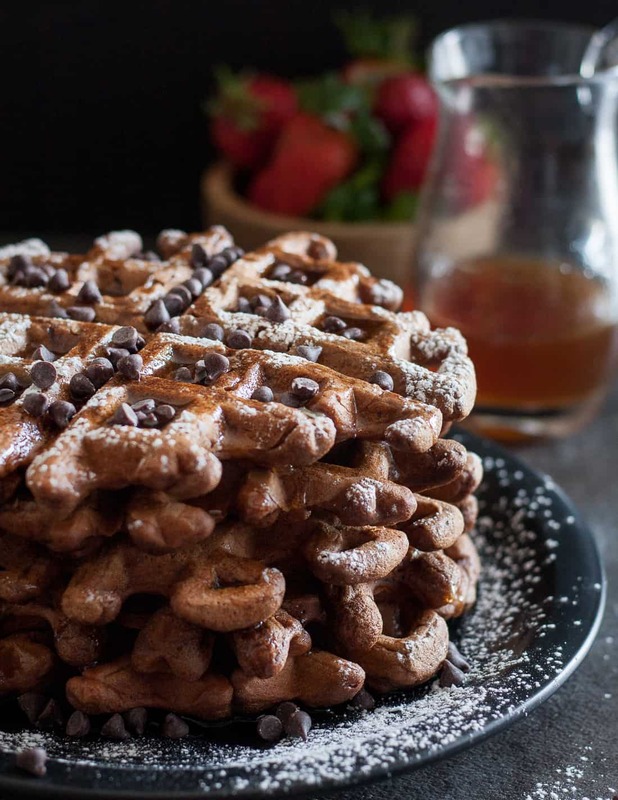 If I wanted to make this larger…do I simply double the ingredients? If I want more of a pronounced Guinness flavor can I add more beer. Ive got these bad boys cooling right now! Fingers crossed it worked . I upped the sour cream to 1 c now i wait!! 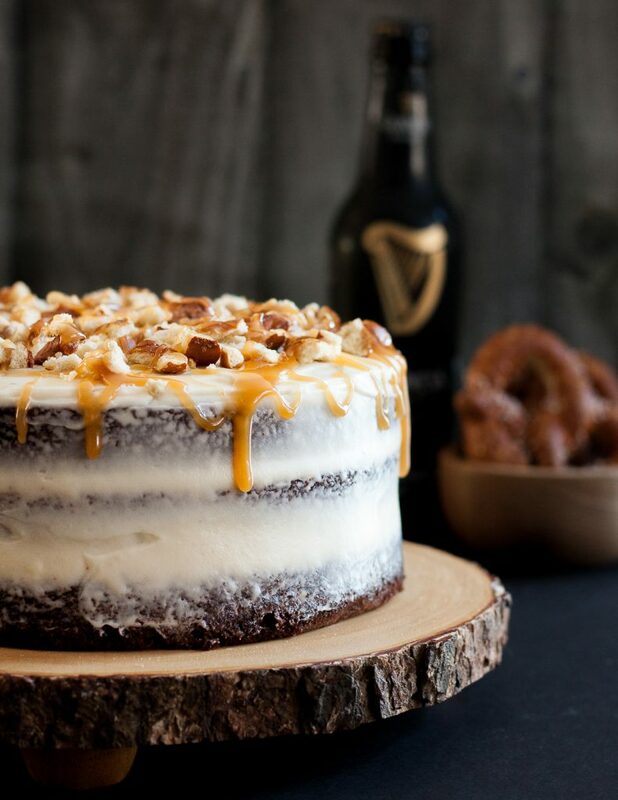 I’m not a beer drinker but since everything is better in cake this has got to be a must try for St. Patrick’s Day this year! What a absolutely beautiful cake. And I bet delicious too. You can’t go wrong with beer. What size guinness bottle? How many oz? I believe Guinness comes in just a single size bottle. The draft is 11.2 and the stout is 12 ounces (or something like that). You typically use the draft beer in cooking, but I’ve used the stout as well depending on what the Godfather buys. Since the difference is less than an ounce, there’s no noticeable change in the final product, so use what you have. I love the recipes. Do you have one for Guinness Chocolate cupcakes. I do, but it’s not posted yet. Send me an e-mail (mary @ goodiegodmother. com) and I’ll send it to you when I get back to my computer next week.